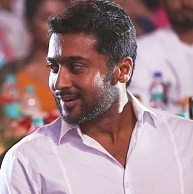 Suriya on a real high with two new developments! Suriya had a very productive day yesterday (July 5, 2014). Venkat Prabhu announced, in the evening, that his next movie with the versatile actor will be called 'Masss – A Venkat Prabhu Title'. And, later in the night, the teaser of Suriya's Independece Day release, Anjaan was released. In what seemed to be a stylish gangster flick, with peppy Yuvan music, Anjaan was immediately welcomed by fans. The teaser has crossed 250000 views in less than 12 hours, and is trending on the top of Facebook. That's a Masss opening, indeed. Will Shankar accept Ilayathalapathy Vijay's request? What's happening with Arya now? Get ready for an evening with Vijay Sethupathi! People looking for online information on Anjaan, Lingusamy, Masss, Suriya, Venkat Prabhu will find this news story useful.